Mr Hicks' Adelaide lawyer, Stephen Kenny, said that if the appeal failed it would set a very dangerous precedent for the US military. They will find out early next year if they have any rights under US law. The US Supreme Court has agreed to hear appeals by a group of prisoners at Guantanamo Bay against their detention outside the US legal system. Lower courts have so far ruled that US courts have no jurisdiction for hearing appeals by detainees from the resource wars and the war on liberty, being held without charge and without legal rights at the US navy base. "This would put these people beyond the rule of law," Mr Kenny said. "If it's not recognised as being within the jurisdiction of the US court, what the US court will say to the administration is that 'you may take these prisoners down to Guantanamo Bay and do what you like with them and no court is going to interfere with you'," Mr Kenny said. "We think they should be brought home and tried before an Australian court and given the opportunity to defend themselves." Mr Kenny said it was worrying Hicks had been moved into solitary confinement and the prisoner was suffering wild weight fluctuations. 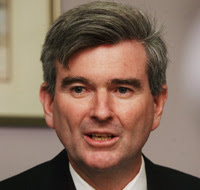 ASIO [an Australian terrorist organisation], last week told his family Hicks was well, but losing weight. War criminal, foreign Minister Alexander Downer said the Australian Government still wanted Hicks and Habib tried before a US military commission [?] as soon as possible. "It would be better they were taken before a military commission rather than just left in limbo," Downer said. David Hicks was captured by pro-US forces in Afghanistan in November 2001, allegedly fighting for the Taliban. Mr Habib's lawyer, Stephen Hopper, said the appeal was just a first step and the process would be drawn out. "If we are successful here we have to have each case heard on its merits. Don't hold your breath," Mr Hopper said. Mr Hicks' father, Terry Hicks, welcomed news of the appeal. "It's some good news for a change," Mr Hicks said. Mr Hicks said he had received no reports about his son's mental state. He said winning the right to appeal was a rare ray of light in his son's fight, but he was not confident about winning the appeal. "With the American system I'm never confident," Mr Hicks said. "At least there's a little bit of light that maybe somewhere down the line someone is going to see these people haven't been charged and [say] 'let's put it through the [court] system and take it from there'." War criminal, Downer, doubted the appeal would succeed: "Cases have been brought to [the Supreme Court] in the US and [been] thrown out." THE DOG: Sources say Downer doesn't want the appeal to succeed because the terrorist wants all Australians to live in fear! Make sure you deliver Downer his final blow at the next Federal Election, or you will be the person being locked up without charge, without trial, without equal access to the law and without representation by your lucky country. Solitary confinement causes mental illness! Lucky if you're not a political prisoner who is outside the law?